Life changes. Be ready for whatever the future holds. Take care of yourself and your loved ones Learn ways to balance family priorities with your own financial goals. Learn ways to balance family priorities with your own financial goals. These benefits could help you manage your family's education costs. 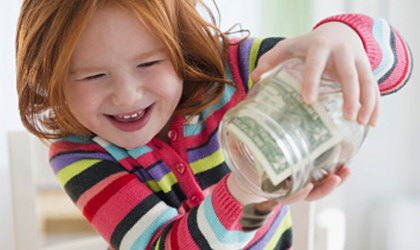 Three really important financial moves every new parent should consider. A budget can help you keep spending in line and reach your goals. Use this tool to estimate your current net monthly cash flow. Not sure where to begin saving for a child's college expenses? This checklist offers a few simple steps for you to get started. Five things to consider when you're asked for financial help. Engaged? How well do you know each others finances? Marriage is more than a romantic union; it's also a financial one. An open dialogue can help you save, invest and plan together. Watch this video to learn tips on how to manage money with a partner. Help your young children benefit from your experience. Learn how to prepare financially and protect your growing family. A checklist to help you make the planning process efficient and effective. Tips for building a strong financial union. Steps you can take to be financially prepared for the decision-making and reduced income you may someday face. Learn how to plan and prioritize so you can save for your family's short- and long-term goals. See how small changes in your spending could accumulate over time.